Games Traitors Play is the sequel to 2009's Dead Spy Running and is the middle part of the "Legoland" trilogy, Legoland being the nickname for the MI6 building at Vauxhall. And as before, the audio edition was published one month before the print edition. The hero of this set of books is MI6 agent Daniel Marchant, the son of a former head of MI6 who is not trusted by the Americans but has the absolute trust of the current MI6 head, Marcus "the Vicar" Fielding. As a result of the events in Dead Spy Running, Daniel has been grounded for a year by the Americans and is only now able to continue his mission to find his half-brother, Salim Dhar, who is also the world's most wanted terrorist, and turn him into a secret asset for Britain. Daniel's pursuit of Dhar takes him to all over the world: Morocco, Sardinia, India but it seems the only way to meet Dhar is for Daniel to defect to Russia which is from where, Dhar's believed to be planning an attack on Britain. Daniel's the only person who has a chance of stopping him. There is plenty of action in Games Traitors Play with an exciting opening chase sequence in Morocco and a nerve-wracking finale in Britain and a fascinating look at what goes on in a huge Indian temple mid-way through. Daniel meets some familiar faces from the first book - both friends and enemies and makes more of each along the way. Games Traitors Play contains plenty of double-crossing and complicated political manoeuvring in particular when Daniel is trying to convince the Russians he wants to defect and the Russians have to be made to believe him. Daniel and Dhar's father seems to be pulling the strings from beyond the grave. Games Traitors Play does give away nearly all the surprises in Dead Spy Running so it would be better to listen to them in the correct order. Dead Spy Running is a superb thriller and one that set a very high standard and I didn't feel that Games Traitors Play was quite as continuously gripping. Nonetheless it's still a very entertaining and enlightening listen and I'm looking forward to the next instalment. As before, the narration by Paul Panting was superb, in particular the slightly harsh voice of Daniel and the refined, quieter tone of Fielding, and I hope he is available to record the final part of the trilogy when it's released. 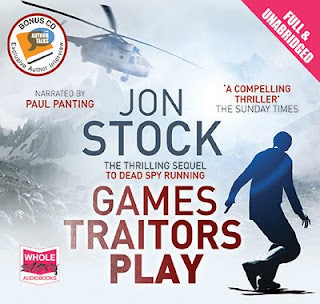 There is a bonus disc with Jon Stock being interviewed by Maggie Mash (who narrates Stella Rimington's spy-series) and includes a few details of some new settings in book three, plus the fact that he wants Daniel to carry on after the trilogy. You can follow Daniel Marchant on twitter: @MarchantMI6 and read more about the books and Jon Stock at his website. I really enjoyed reading Dead Spy Running, and agree with you, it kept up a cracking taught pace. I look forward to reading the sequel. Many thanks for review. Karen - Thanks for the fine review. I'm glad you liked this one! And I know what you mean about reading/listening to books in order. I found that true of Simon Beckett's David Hunter series, too.